A workforce of almost 46,000 rag pickers goes through the waste generated by Delhiiites to segregate the reusable from the rest.Yet, according to a report published by the Central Pollution Control Board (CPCB) in 2013, out of the total waste collected, only 12.45 per cent of the waste is scientifically processed and rest is disposed in open dumps. Every day 9,400 tonnes of garbage is being produced and is not being managed appropriately. This poses serious threats to the Delhi’s air quality as dust and other particulates from the dumps are spread across the city by the wind. The waste produced is called municipal solid waste and is managed by local government bodies and some non-profit organisations. Annually, about 3.8 million tons of municipal solid waste is generated in Delhi. This ranges from dust gathered while sweeping streets to debris generated in construction sites. This waste occupies one-third of the total space available in landfill sites across the city. “I have been doing this for last seven years and I have come across a lot of filth and dirt which people generate daily. This dirt not only includes newspapers but liquor bottles and plastic,” said Ram Yadav, a rag picker stationed in Dwarka. “This business is not organised; I do not know where this garbage goes and how it is treated. I earn my living by collecting the items that can be sold in the market, the rest is probably sent to local dumpsites,” Yadav said. These rag pickers separate the different articles in the garbage and make separate piles.Wet waste is sent to compost plants and the rest is dumped at the landfill. The Ghazipur Landfill is one of the biggest landfills in India; from afar it looks like a mountain. Over the years the garbage has piled up to create this mountain. It omits a stench that is unbearable, yet many people live beside it. On September 2, 2017 a large chunk of garbage of fell on the road beside the landfill, killing two people and injuring many. Government took severe steps after this, banning the dumping of garbage in Ghazipur. However, people took little notice as tons of garbage is still being dumped at Ghazipur. In Delhi, the waste generated from houses reaches the dumpsters and is then taken to landfills to be segregated. “We have provided local carry vans and all the equipment needed to ensure 100% waste segregation, this has helped since people have become more aware of Swachh Bharat Abhiyan and have taken steps in that direction.” says Yogender Mann, Public Relations Director, North and East MCD. Not only Delhi but no other city in India can claim that it has segregated 100% of the total waste generated as only 70% of this waste is actually segregated. The remaining 30% gets mixed up and lost in the urban environment. Prof. S.M Akhtar, Dept of Environment Studies, Jama Millia Islamia University. How is it related to air pollution? “I believe that the major source of pollution is dust particles from construction sites and landfills. All this catalyzes the depletion of watersheds and the green mass of the city.” said S.M Akhtar, a professor of environmental studies at Jamia Millia Islamia University who has claimed that the studies conducted on Delhi’s air pollution are faulty as these were conducted using wrong parameters. Akhtar said that while other big cities such as Mumbai are linear in construction, Delhi is non- linear. The nonlinear construction of Delhi allows the wind to blow in every direction inside the city, causing the dust particles from landfills to be spread everywhere. 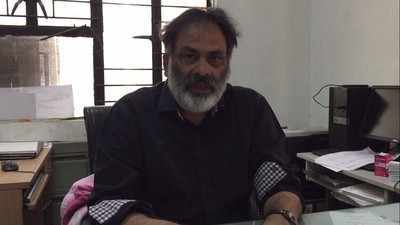 Akhtar has suggested the creation of micro-forests perpendicular to major wind directions in the city and making winter a no-construction season will help reduce its air circulation problems.